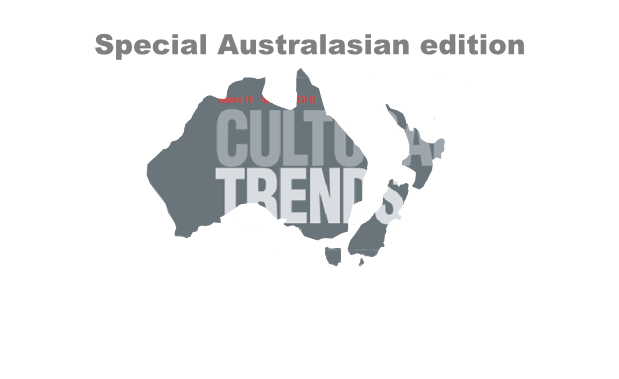 As well as coordinating the special edition, I drafted two editorials (pre-print drafts available below) in which I try to crystallise the state of cultural statistics and cultural policies in Australasia – a pretty tall order for the space allowed! My articles A poverty of inquiry and Encouraging the academy build on some of the issues raised in the editorials. Links to pre-print versions of the editorials are below, along with a full list of contents. Article abstracts can be viewed online, and full articles can be purchased direct from the publisher. The journal is also held by a number of libraries in Australia and New Zealand. The good people at the Australia Council library have provided me with a list of libraries, which is reproduced at the bottom of this page. This entry was posted in Cultural policy, Research tools, models, analysis and tagged Arts policy, Cultural policy, Cultural statistics, Linkedin by Christopher Madden. Bookmark the permalink.